As promised, this week we have a picture of Yarrow. It has been used for various things, by almost everyone in the world, ever since we first thought of it. Google and I explore the internet regularly, looking for interesting facts that would be of benefit to mankind generally – and to you, gentle reader, specifically. We have noticed, on these information-harvesting forays, that the longer humankind has been using a naturally occurring plant, landscape feature, or substance, the more names we give it. I won’t bore you with the couple of paragraphs of ‘folk names’ that are currently synonymous with Yarrow, except to mention Milfoil, which is the alias Yarrow tends to use most often today. We’ve been eating the stuff as a salad vegetable or spinach substitute for ever – but these days, medicinally, its main use seems to be as an enhancer. It makes whatever else you’re taking work better. It seems to work especially well on normalising blood pressure. So be careful – if you’re taking other medication for that sort of thing. Just stick to rubbing it on sword cuts – it seems pretty safe for that. I have a nice picture of some Harebells – or Scots Bluebells if you live a few miles further north. 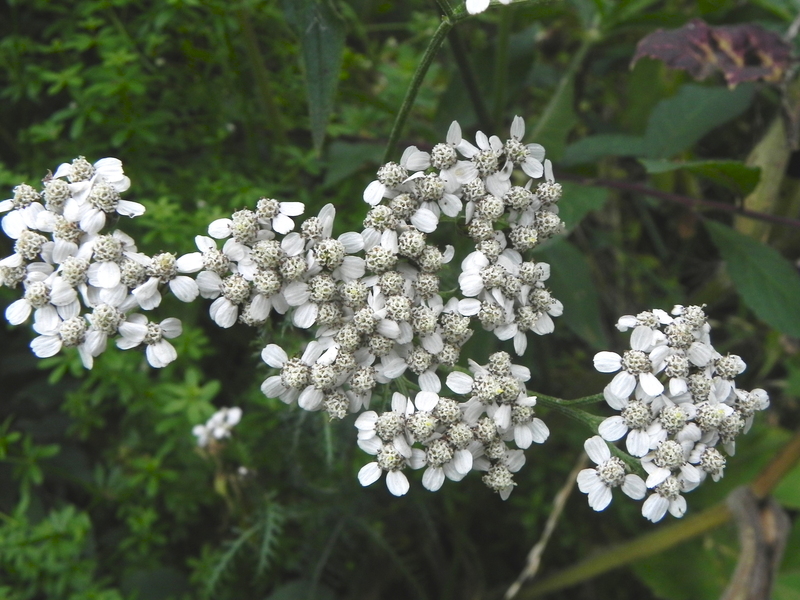 Then, I have a good picture of Yarrow, currently taking over as the white, umbelliferous blossom of choice on the roadsides and verges. Both these plants have magical associations and I was sure you’d be interested in them. Then, there is the interesting inference that can be drawn from the fact that both of these ‘power plants’, from the realm of faerie, have appeared as autumn draws near. This led me wonder if this part of the year – with the abundance of nuts, fruit, and seeds – was especially magical. Looking at it from a strictly business point of view. Now that the harvests are in, customers are more likely to have purchasing power, and – in the dim and distant past, as today – no doubt they were in the market for love charms, relationship advice and personal forecasts for the year ahead. 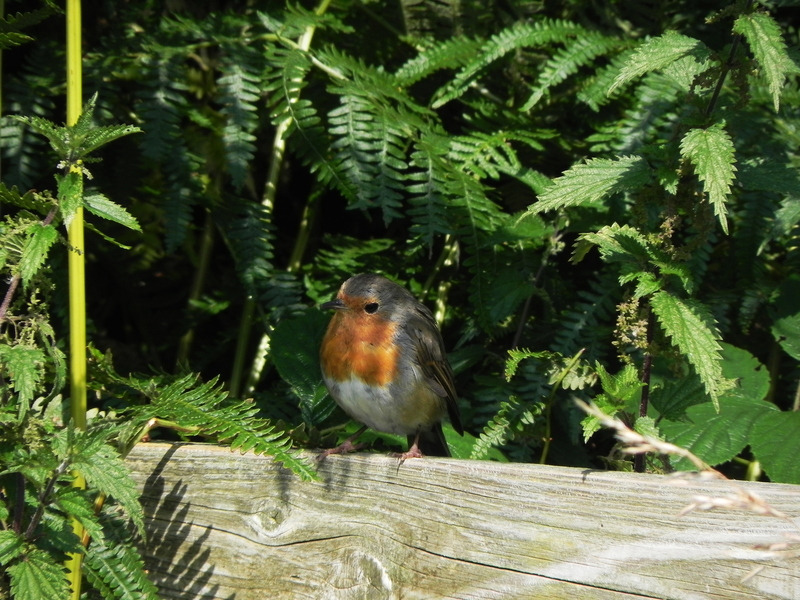 And speaking of predictions, who would have guessed that this Robin would come and perch not six feet away from us? Not only that, but he sat there, patiently, while I took several pictures. Magical! There are times when you watch an endless progression of dark grey clouds hurrying past the window, hoping for a glimpse of blue sky. Day after day, waiting and hoping. Surely we must get some decent weather soon! Then, magically, the skies clear – but it only happens at night. This Sweet Chestnut tree offers us a similar challenge. 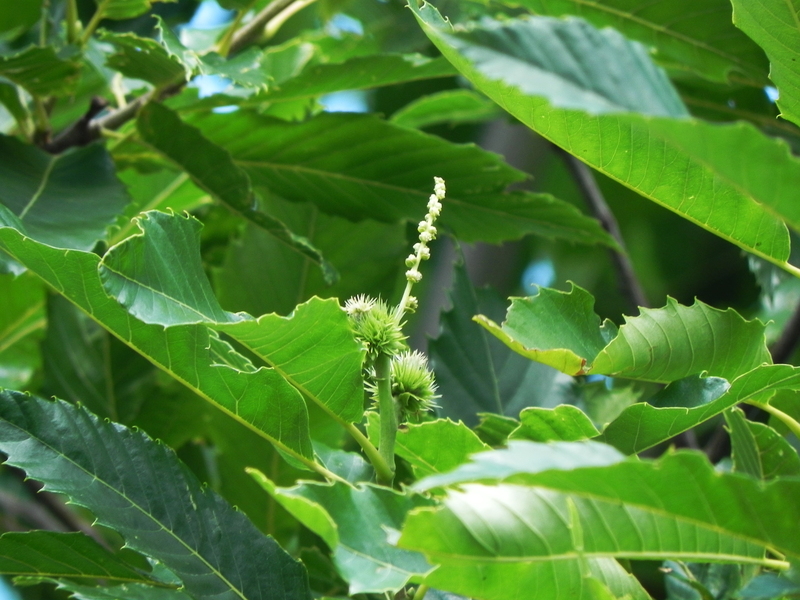 We know that, unlike most other trees, it flowers later in the year. Still, we keep an eye on it right through Spring into May and June. Leaves appear and we start to anticipate the arrival of the flowers. The flowers themselves, are quite difficult to see, they are insignificant, wispy things. Still, the first sight of them peeking furtively from behind the leaves, is a cause for moderate excitement. From this initial sighting we monitor the tree on alternate days, looking for some sign of progress. You know, they’re flowers – they should, actually, flower? Nothing happens. Weeks pass and nothing is still happening. Surely, soon the tree will burst into flower and we will be able to photograph it in all its glory? Nothing happens again. Then, suddenly, there are young nuts forming at the base of the flower we have been waiting and watching over all this time. The wretched tree has gone and had its babies without telling us! They are quite cute though – twins, I think. There are times when rhymes and reasons conspire to produce circumstances that seem, not just reasonable, but imperative. We entered one such vibrationally resonant node as we reached the tee junction, on an otherwise uneventful amble, the other day. It suddenly became clear to us, that this day, the fates had decreed that we should walk all the way round the block – rather than turn around and retrace our steps as we usually would. Nothing loathe, putting all our faith in a benevolent, even beneficent, Universe – we set off. We pottered along towards the tunnel in the railway embankment – waiting, hopefully, for a train. On this day however, there were no obliging trains, and we made our way through the tunnel. Naturally, we paused halfway to stamp and clap – to wake the echoes who spend most of their day dozing peacefully there in the gloom. While dawdling close to the tunnel entrance, I came across this flower growing in the rivulet that flows alongside the road. I sent Google off to look around and see if he could find out what it was. He offered me three choices. 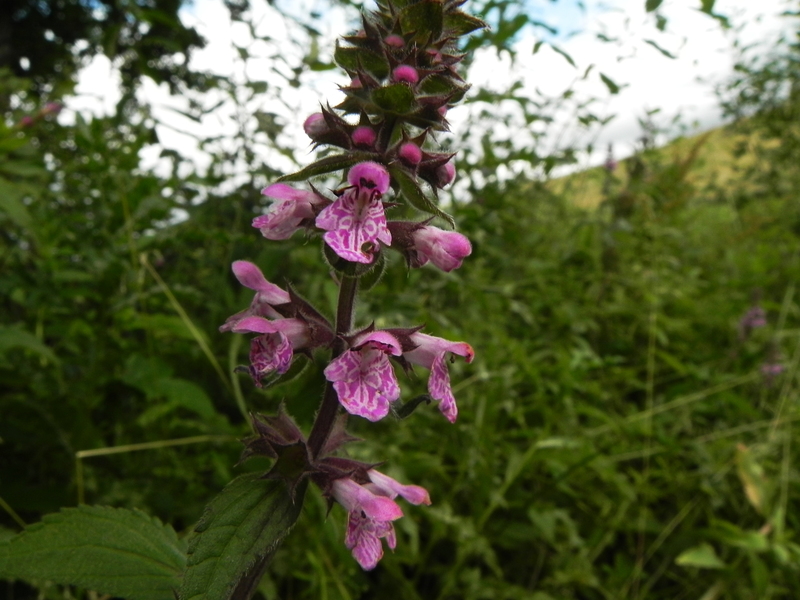 Field Woundwort, Hedge Woundwort or Marsh Woundwort. As usual, all three looked identical. ‘Yes. But which one is it?’ I asked. He seemed quite hurt. Hadn’t he just spent 0.026 seconds finding me more than five million answers? Surely, I could pick one out of three on my own!